Have you ever wanted to try your hand at growing your own produce? Well now you can. 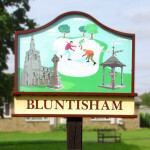 Bluntisham Parish Council have one available allotment plot for the coming season. The plot is available for only £20 rent per year which includes water. The allotments committee are a friendly bunch and all plot holders will make new comers welcome. The latest edition to the allotments is a eco-friendly toilet.